A large, chunky sparrow, the eastern towhee was once lumped together with its western counterpart, the western towhee, as a single species, the rufous-sided towhee. While these two birds do share many characteristics, their different ranges and plumage markings highlight the distinctiveness of each bird. Markings: Dimorphic species. Males have a solid black hood that covers the head, back and breast, descending down the chest in a U- or V-shape. A white patch shows at the base of the primary feathers on the black wings, and some minor buff or whitish edging may also be visible on the primary feathers. The black tail has white corners that flash obviously in flight. The flanks are boldly rust-colored, and the belly is white. The undertail coverts are buff or faintly rust. Females have similar markings, but are a warm cinnamon-brown where males are black, and they show less white on the wings. For both genders, the eyes are red, though southeastern birds have paler eyes and Florida populations may have white eyes. The legs and feet are pale. Juveniles are heavily streaked brown and buff, particularly on the underparts and back, and their bill is paler. These chunky birds prefer sheltered, secluded habitats such as brushy thickets, forest edges and shrubby riparian zones, and they may be found in either deciduous or mixed deciduous and coniferous regions up to 6,500 feet in elevation. 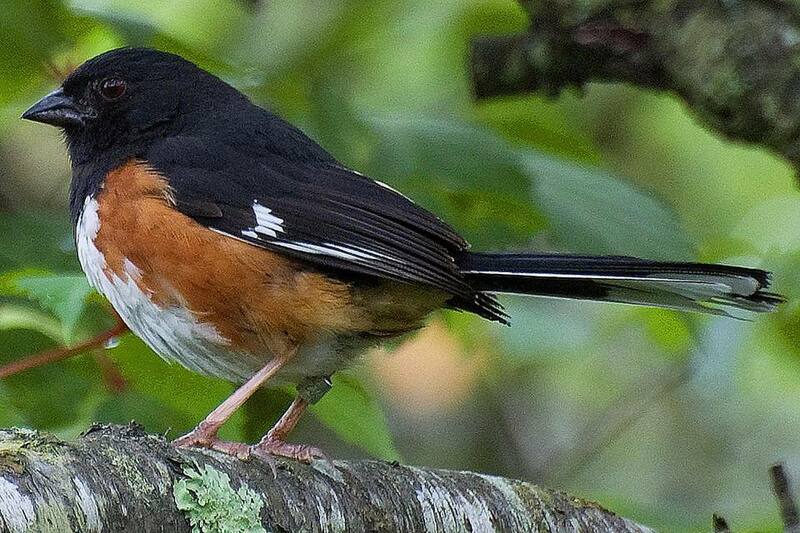 Eastern towhees are year-round residents in the southeastern United States, from Florida to as far north and west as eastern Massachusetts, southeastern Pennsylvania, southern Ohio, southern Iowa and eastern Kansas. During the summer breeding season, they spread further north to southern Ottawa and throughout Michigan, Wisconsin and Minnesota to southern Manitoba and eastern Nebraska. In winter, the southern range of the eastern towhee spreads slightly west to the eastern portions of Texas and Oklahoma. Vagrant sightings are occasionally recorded somewhat further west of this bird's expected range, as well as much further north into Newfoundland. Very rare sightings have been noted in Great Britain. These birds have a clear whistling song with a warbling trill at the end. The 1-2 second song is often described with the "drink-your-tea" mnemonic. A softer, quick tu-heee call is also common, and has a slight pitch rise at the end of the call. These are relatively solitary, secretive birds that prefer to stay concealed in brush, though males may choose exposed perches for singing, particularly in spring when they are claiming territories and attracting mates. During the spring and summer, eastern towhees may stay in pairs while feeding, but males can be aggressive toward other males and may use a variety of threat displays to demonstrate their strength. While foraging, these birds use a backwards double-footed hop to clear away leaves or other debris and expose seeds and insects. When active, they often hold their tails elevated. These are monogamous birds that mate after the male attracts a female by showing off his tail corners, though he may chase her away at first before gradually accepting her presence. The female builds a cup-shaped nest using sticks, grass, rootlets and bits of bark, lining the inner cup with finer materials. The nest may be built on the ground or in a low shrub, typically no higher than five feet above the ground, though some higher nests have been recorded. The oval-shaped eggs are pale, creamy white or grayish and are speckled with brown, red-brown or gray markings that may be concentrated more on the larger end of the shell. There are 2-6 eggs per brood, and the female incubates the eggs for 12-13 days. After the altricial young hatch, both parents feed the chicks for 10-12 days. A mated pair may raise 1-3 broods each year, with multiple broods more common in the southernmost parts of the eastern towhee's range. These birds are frequent hosts to brown-headed cowbird eggs, and where their range overlaps with the spotted towhee in the Great Plains, hybridization is relatively common. While these birds are secretive, they will come to bird-friendly backyards that provide suitable shelter with shrubs, grasses and brush piles, particularly if thicket-like plantings include berry bushes. They may visit ground feeding areas or large, low platform feeders if cracked corn, milo, millet, oats or peanut hearts are offered. Ground bird baths can also help attract eastern towhees, and they will readily forage in leaf litter. While these birds are not considered threatened or endangered, their populations are declining, particularly in the northeastern part of their range. Continued land development that leads to habitat loss is believed to be a factor in this decline, and overuse of pesticides that removes the eastern towhee's food sources is also an issue.